Professional rug cleaning is the best way to make sure your rugs look fantastic for years to come. Clean rugs are so important for the quality of your rugs. When choosing a rug cleaning company, it’s important to pick one that you can depend on and that will make your rugs look amazing. KIWI Services in Carrollton has 30 years of experience cleaning rugs and we are the trusted choice of over half a million happy customers. KIWI is a rug cleaning company with a unique method of cleaning that is guaranteed to get your rugs looking great. We use the tried and true method of hand washing your rugs to avoid dye bleeding that can come from cleaning them with harsh chemicals. KIWI has a rug cleaning team that will absolutely get your rugs looking great. Our team consists of a senior rug expert, a master rug weaver, and a fringe surging and binding specialist and highly skilled and trained rug cleaning technicians. 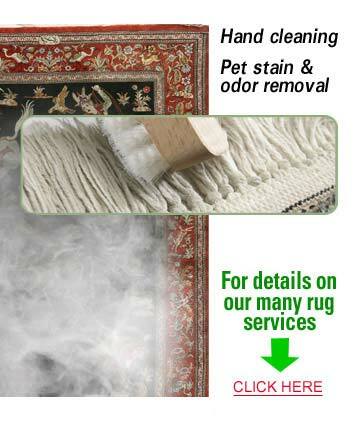 KIWI offers free pickup and delivery for all of the rugs we clean as well. KIWI is dedicated to happy customers. We want to always make sure that you are 100% satisfied with your cleaning, which is why we offer a 30-day clean guarantee on our rug cleaning services. If you should run into any issues give us a call, and we will be back out to perform a complimentary re-cleaning. KIWI also offers free pickup and delivery on all of the rugs we service.